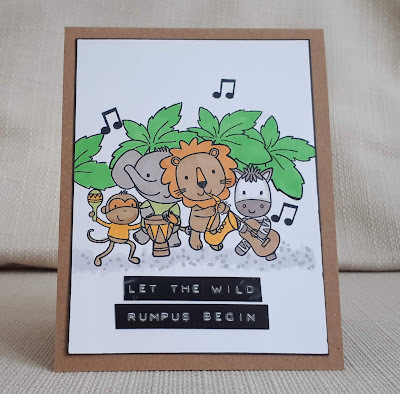 For my first card I stamped, masked and coloured some wild things (although the wild things in the book are monsters) from a MFT set. I used a Dymo to create the sentiment, which is a quote from the book. Actually, I did the quote from memory but then felt the need to check it - turns out there are two published versions, one that uses the word 'begin' and the other 'start'. My second card isn't new ...it was a Valentine's card I made for my son in 2016 and was posted to my blog then. This photo was taken at the time but I recently found the original in the bottom of my son's wardrobe along with old school projects etc. I used a die-cut monster and boat and another quote from the book. I'd love it if you popped over to The Library and entered the challenge. This is wonderful Marina! 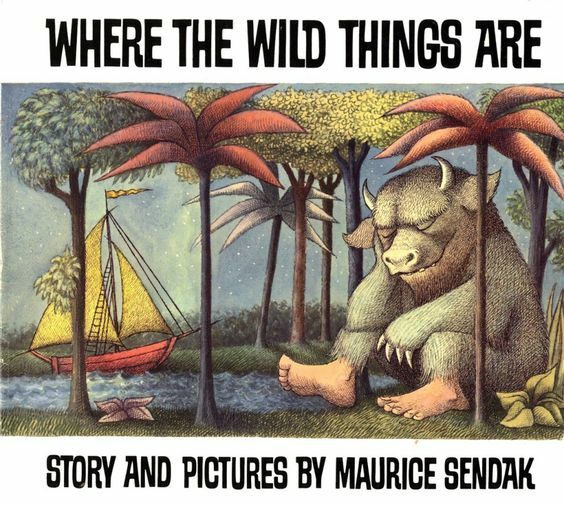 I thought I'd never heard of that book, but the picture at the end of your post tugged on 'something' deeply hidden in my brain. Now I'm not so sure. Love your card! Your jungle creatures are gorgeous and I can almost hear the rumpus starting!! Thanks for sharing this with us at Passion for Promarkers! A fun book for your theme and I love both cards! The wild rumpus looks like a normal day at my house. This is a definite "10" on the cute-o-meter! Your sentiment is great and I love the very organic nature of this design. I had forgotten about this book as well until it appeared on one of President Obama's summer reading lists that he use to post on Twitter and FB! Thanks so much for sharing with us at Shopping Our Stash! 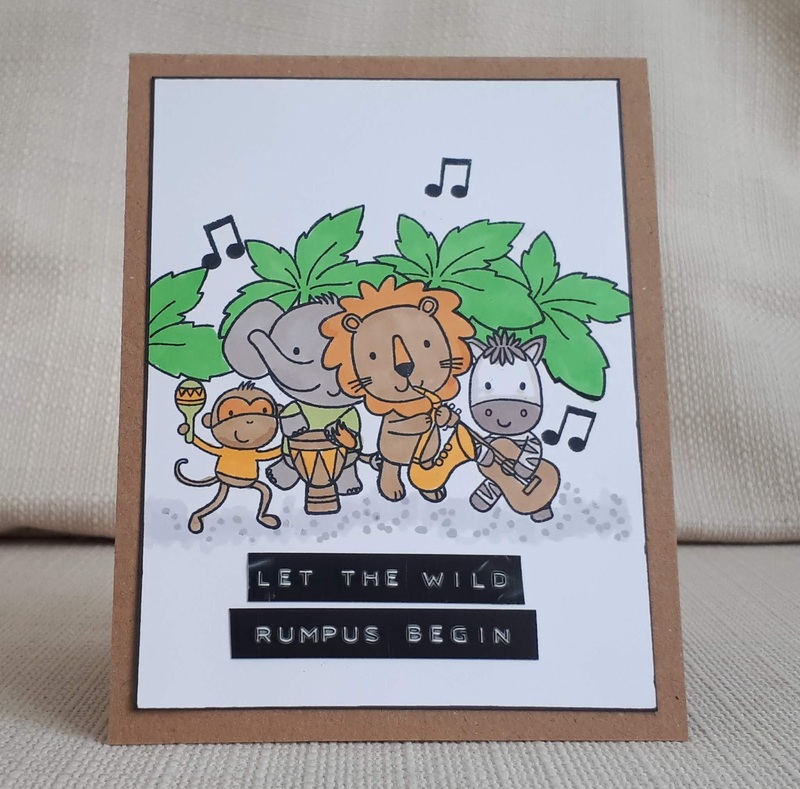 The jungle rumpus card is just superb! Love your colouring. 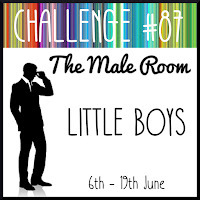 Thanks so much for playing along with our Little Boys theme at The Male Room. Deborah, DT. 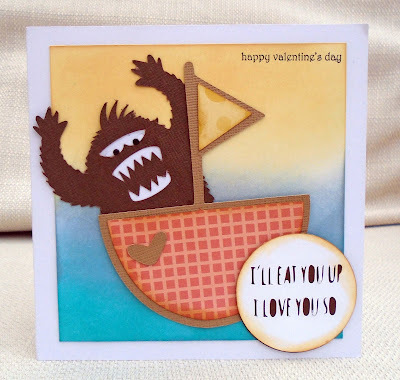 PS I think The Wild Things is fab and your Valentine card is awesome!! A lovely card for our challenge this time at Passion for Promarkers, thank you for joining us. Two fun and adorable cards, isn't it fun to look back at a card we made years ago! Such cute cards-- both of them. Terrific use of quotes from the book. I remember it as "begin" also, but we have 3 copies in the library-- I'm going to look today to see if we have two versions! Interesting! Thank you for sharing at SOS, too! Oh I love your fun animal band, perfect for a little boy. Thanks for linking up at The Male Room. Oh, such fun cards...so cute!! I don't recall the book, but the card is just too cute with those critters marching and playing music! Adorable Valentine too!! Two amazing makes! I don't know this MFT set -the critters are adorable! I hope to play along in your library challenge now again when I'm on my holidays. Great job on the stamping and masking. That is one of our favorite books too. 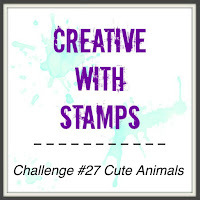 Thanks for joining our cute animal challenge at Creative with Stamps.